“We buy Ugly Houses” and “We will pay cash for your home” signs are proliferating some neighborhoods again. It is unfortunate that there are many walking door to door in any number of neighborhoods across the city offering cash money for homes and allowing the owners (sellers) to remove all of their appliances, mantels and windows – whatever they like. Generous souls, they are, or so they say as they befriend victims. These people possess all of the charm of Eddie Haskell and are equally as genuine. In a recent example, one developer offered the owner of a home in moderately good condition $130,000 for her house. She has a double lot, but he informed her that the electrical line running over it would prevent anyone from subdividing her property. Her conditions were such that she was inclined to take the offer. Thankfully, she had worked with a non-profit in the past and phoned the executive director, who contacted a Realtor. Within a matter of days, he sold the property for $265,000 to a legitimate developer – most are – and found her a home across the street that was completely remodeled for $235,000. The predators are out there and have no guilt. Their victims are usually the elderly on fixed incomes and, after they sell their homes, have no place to go. 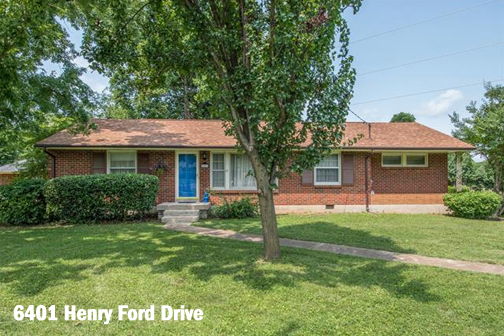 The house located at 6401 Henry Ford Drive sold last week for $181,500 after going under contract in only four days. It was listed at $195,000. Shalene France Gray of Village Real Estate Services listed the home and discovered in only a few days that she may have been a bit aggressive. As college football players transition into the NFL, the most challenging and surprising aspect of the pro game is the “speed of the game.” It’s similar in residential real estate. In the past – 2011, for example – a real estate agent would list a property, and it might be shown a time or two a week for three weeks. Then, in the fourth week, an offer might arrive. At that point, the negotiations would begin, and it became a matter of how low the seller would go. It was anyone’s guess as to how long it might take to procure another offer. In most cases, if the seller lost the original buyer, the second offer would be lower, leaving the seller to wish for a second chance with the previous buyer. In today’s market, and in this price range, the sellers know within hours how they have fared, as there is a flood of showings and a bevy of offers submitted. As the sellers and their agents peruse the offers, the sale price becomes evident. Often, there can be 10-12 offers on a house in this range with 25 percent being low-ballers holding out hope that they have found the magic seller that they have read about in the how-to–make-millions-overnight books. Then there are 25 percent to 50 percent more basing their offers on past sales, and their agents are quick to add the chosen comps in order to prove their offers are acceptable, as if the listing agents are unable to run comps themselves. The next batch of offers are all close to or more than list price, leaving Realtors and their clients must evaluate each offer based on the contingencies. For example, a “sale of home” contingency will not fly these days, and if there are conventional loans versus FHA/VA loans, the conventional loans usually win. In the three-bedroom, two-bath home in Charlotte Park, the offer of $115 per square foot was obviously the best, and the ever-present Cathy Umstead of Keller Williams Realty won the prize and the home for her client. Unfortunately for these sellers and other like them, as cute as the retro décor and appliances are, and although they are more than likely more durable and more functional than their trendy stainless steel replacements, it’s not what buyers want. Buyers expect the HVAC to work and the roof to be free of leaks and for the appliances to be functional. There are no bonuses for those benefits. A 5-year-old roof or HVAC has no more value than a 5-week-old roof or HVAC. A few dollars in the kitchen and baths would have gone a long way.